5G is the next-generation mobile networking standard that will build on the global 4G Long Term Evolution (LTE) ecosystem and targets a raft of new service opportunities. This report investigates a critical part of the 5G system architecture: the 5G core (5GC) network. 5G technology development is underway, with myriad laboratory test beds and trial networks in operation worldwide. Experience with prototype equipment, and progress on standardization, has given progressive operators the confidence they can launch commercial 5G services in 2019, perhaps even in 2018 on a limited basis, ahead of the 2020 target date. Examples of operator pursing an early launch include KT, NTT Docomo, T-Mobile USA, AT&T and Verizon Wireless. In advanced economies, we expect many more operators to follow through the 2020-2021 period. Much of the focus in 5G is on radio performance – spectral efficiency, latency, frequencies, etc. – and how to enable services with diverse performance requirements over the air. To actually deliver services over a 5G RAN, however, also requires a system architecture and core network. The core network provides functions such as authentication, session management, mobility management and forwarding of user data. The design of the core network is therefore influential on the overall system architecture and is fundamental to a 5G network. In fact, there is a school of thought that views the 5GC as ultimately a multi-access core network that will have a wider impact than 5G RAN itself. Use an existing, modified 4G core network and then upgrade to 5GC later; this is known as non-standalone (NSA) mode and will be specified at the end of 2017. Deploy a new, designed-for-purpose 5GC network. This is known as 5G standalone (SA) mode and will be more capable. It will be specified from mid-2018 onward. Both approaches have merits and, at this stage, both look likely to be pursued. Upgrading an existing 4G core to support 5G radio will be simpler and faster, while deploying a new 5GC will be more challenging in the near term, but more extensible to future services. 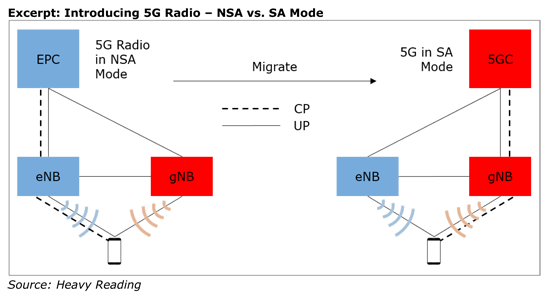 Whichever option the operator chooses, over time a new 5GC network will be needed as operators that go early with NSA 5G deployment will later need to migrate to SA 5G. Over time the multi-access core network is important to the 5GC strategies of some powerful and influential operators, particularly large integrated wireline/wireless providers. This view holds that the 5G is not only about radio, or may not even be primarily about radio, but about a new architecture that supports fundamentally new service capabilities and business opportunities. The 5GC is, therefore, a key pivot in the "5G-as-a-platform" view. Even if they initially deploy 5G in NSA mode on a 4G core, in time operators will need to deploy a new designed-for-purpose 5GC network, as shown to the right of the excerpt below. In this scenario, 5G can be deployed without dependency on LTE, and where both access networks are used, the master and serving cell roles are reversed. Investigating the 5G Core Network & System Architecture is published in PDF format.